Halifax have signed Wales prop Dan Fleming from Toronto Wolfpack on a two-year deal. The ex-Bradford Bulls forward is set to come straight into Richard Marshall’s squad for Sunday’s friendly at Championship rivals Featherstone Rovers. Halifax-born Fleming, 25, has also featured with Castleford Tigers in Super League and played 15 games for Toronto last term as they swept to League 1 glory. Marshall said: “This is great news for us. “He’s a good lad is Dan. I’ve watched his career over the last few years and he’s another Halifax lad. “It’s brilliant that we’re getting these lads back playing for the club. “Toronto agreed to release him; he’s got a young family, has just had a baby and, with the travelling involved for Wolfpack, training in Manchester as well, he wanted to get closer to home. Halifax are looking to make big improvements in their final warm-up game this weekend after slumping to a 62-0 thrashing at Super League Wakefield Trinity last Sunday. Marshall conceded: “It wasn’t great. We know that. “We’re a young team at the moment and we were a bit naive in certain areas. “Wakefield were excellent, mind, and they took everything but we gave them a lot of those chances. “We’re not in a position to change much personel-wise this weekend but we could have a couple of lads coming back from injury. “James Saltonstall, Ed Barber and Elliot Morris might come into the reckoning while Dan (Fleming) will be. “John Duffy is an excellent coach and you can see his influence there in pre-season. Meanwhile, Halifax have completed the signing of 17-year-old amateur Kian Morgan, following a successful trial with the club. 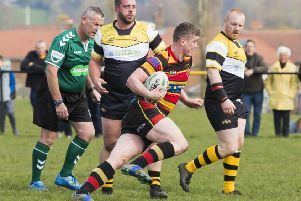 The former Wakefield academy full-back, who has played with Brighouse Rangers and Moldgreen, can also play in the halves and at centre. Morgan featured in the friendlies against Bradford and Wakefield and Marshall said: “He’s been in and around the first-team for the last three weeks and he’s clearly got some ability. “There were a few clubs sniffing around so we acted and offered him a contract. “Physically, he’s not developed enough yet but he’s got some skills and attributes.